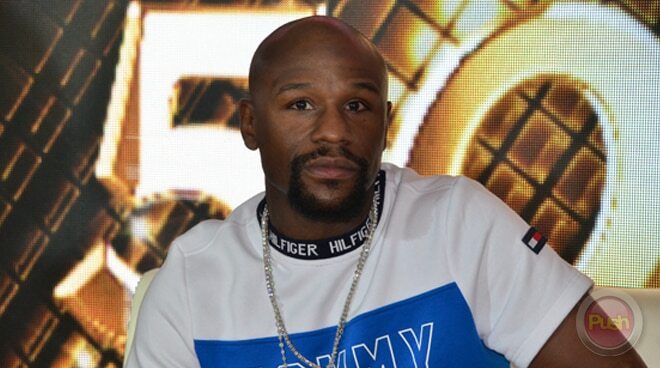 Floyd Mayweather Jr. also explains what keeps him coming back to the Philippines. After being launched as the newest endorser of Frontrow International last year, Floyd Mayweather Jr. gamely faced the press for the first time during an exclusive party event held at the residence of the beauty and wellness brand’s CEO Sam Verzosa. While several fans are clamoring for a re-match between him and Manny Pacquiao, Mayweather said he isn’t keen on one. “I’ve had a great career. Manny Pacquiao had a great career. He’s an unbelievable fighter. I’m a businessman. My focus right now is just Frontrow,” he said. Sharing how Frontrow’s culture of giving back inspired him to be part of the brand, Mayweather shared what made him say “yes” to working with a brand which is located on the other side of the world from him. “I’m worldwide. I feel like the Earth is my turf. So I give back wherever I go,” he said. Mayweather, who chooses his endorsements carefully, explained why he doesn’t feel the need to show off his acts of kindness to anyone—including Pinoys—online. “I don’t need to go to social media to talk about what I’ve done, what Frontrow has done. We’re going to show the world results by making people happy, by making people accomplish what they want to accomplish, by fulfilling people’s dreams,” he added. It’s not the first time Floyd Mayweather Jr. has visited the Philippines. And according to the pound-for-pound king, he doesn’t see a reason to not return to the country. Asked what keeps him coming back to the Philippines, he said: “The people are so loving and so positive. In the US, we have a lot of support but the Philippines is nothing but love and positivity. I love it here. So I will be back,” he said. Floyd Mayweather faced PH’s boxing champ Manny Pacquiao in a fight dubbed as Fight of the Century or the Battle of Greatness back in 2015 where he emerged as champion via a 12-round unanimous decision.